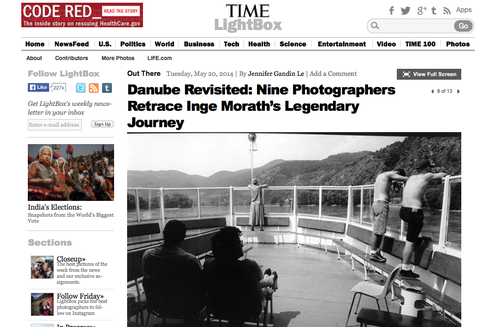 Today’s TIME LightBox feature on Danube Revisited: The Inge Morath Truck Project showcases the project’s unique design to bring Inge Morath’s acclaimed Danube series back to the place of its origins while creating new work inspired by the communities living along the river. “Reading her diaries was like being given a window into Inge’s soul,” says one of the project’s creators, Lurdes R. Basolí, of reading Inge Morath’s unpublished diaries. “She writes so beautifully. After reading them and ‘meeting’ her there was no way we could avoid making our idea real.” Two years after dreaming up the idea, Basolí and the other award winners will spend five weeks honoring a series made over the course of five decades. An ode to their muse and a commitment to women in the field of documentary photography, the nine photographers will promote and collaborate with local female photographers en route. Visit the Kickstarter campaign to learn more.